I had to have a root canal done this morning and the whole rest of the day passed in a daze. This evening, I finally felt like a member of the human race again, but was too down to spin any of the batts that I had already been working on. They are lovely, but somber. 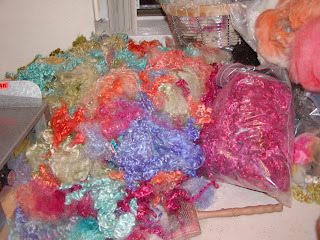 I decided to grab the kid mohair that I have dyed in the past week and throw colors together to see what would happen. They are a lot more vibrant than they look on the carder or in the batts below. I just took a photo of how they look on the bobbin, but I know from experience that they pick up their shine after washing. 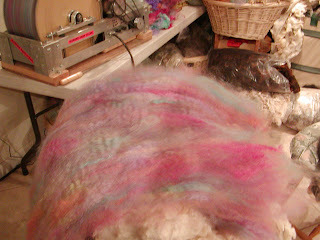 I ran the mohair through the carder one time, so they would not muddy. As I am spinning, I am seeing some really cool color combinations. I am going to spin a batch in berry blue Koolaid, moss green cake icing and violet from the Country Classics. I will probably also do one in pink with purple and the berry blue. The colors shifting as I spin are rather soothing. I plan to design another crochet shawl using one of these combinations. I plan to take at least three projects to Indiana with me next week. Road trips always cause me to think outside the box. One of these batches will be in it for sure. I also plan to take my Little Gem with me. With flight regulations being what they are, I am for sure going to take two suitcases. 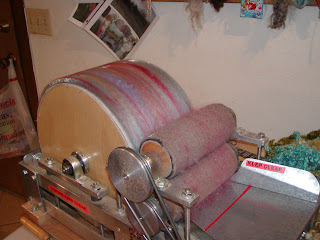 Since I am planning to visit the Wooly Knobs Mill, I need room to bring a bag of roving home! My sister says she takes the kitchen and almost the sink when she takes a trip. I am wondering how I can get my studio inside a suitcase. Two weeks is a LONG time!